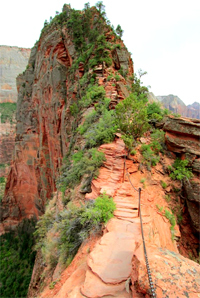 Are you planning to run a marathon, compete in a triathlon or tennis tournament, or go on a long hike? Pretty much everyone knows that you should drink lots of water when you exercise. And, unless you have been living under a rock, you know that sports drinks like Gatorade® exist specifically for this purpose. If you've been told to "drink as much and as often as you can" in order to prevent dehydration during long events like this, then this article is for you. The basis for the "drink as much as you can" (ie., during a marathon, for example) concept comes from several observations. During prolonged exercise, particularly in hot/humid conditions, substantial amounts of fluid are lost due to perspiration and, to a lesser extent, water vapor expired during breathing. Soccer players in Puerto Rico only consumed an average of 2.7 liters per day when allowed to drink as they wish. Their total body water at the end of one week was about 1.1 L lower than when they were mandated to drink 4.6 L per day (Rico-Sanz, et al. 1996). Thirty-four boys (average age 13 yrs) and 24 girls (average age 12 yrs) who participated in a 4-day soccer camp in Pennsylvania during July 2003 were studied. Most of the players were dehydrated by the second day of camp; more than half of the girls were seriously dehydrated at this point. By the last day of camp, 59% of boys and 70% of girls were significantly dehydrated. This occurred despite the fact that coolers of fluids were available within 25 meters and coaches encouraged players to drink and take frequent rest breaks (Mamula PW. 2004). The second reason for recommending that endurance athletes drink as much as they can came from observing some competitors who collapsed after crossing the finish line. The impression was that these athletes were severely dehydrated; they were rushed into the locker room and given fluids intravenously. Thus, based on these scenarios, it seems logical to conclude that people should be aggressive about drinking water during a prolonged event, right? Certainly at one time, the sports medicine community believed it to be the right approach. In 1996, the American College of Sports Medicine officially endorsed this strategy in their guidelines Exercise and Fluid Replacement (Convertino VA, et al. 1996). In this position paper, they urged individuals to "consume the maximal amount that can be tolerated." • Twenty-six runners were identified in the 1998 and 1999 San Diego Marathon who had developed symptomatic hyponatremia. Many of these runners admitted drinking as much fluid as possible during and immediately after the race (Davis DP, et al. 2001). • At the 2002 Boston Marathon, 488 runners were studied after the race and it was found that 13% developed hyponatremia (Almond CSD, et al. 2005). But what about that marathoner or triathlete who collapses after crossing the finish line? Isn't this evidence that fluid consumption should be aggressive? No. It is now thought that the physiologic explanation for this is because venous return (ie., blood flow) to the heart declines abruptly after the athlete stops running. A decline in heart rate and a cessation of the massaging action on venous circulation by leg muscles after the runner stands still leads to venous pooling of blood in the legs. The athlete feels lightheaded, or may even faint. In other words, a drop in blood return to the heart leads to a decline in blood flow to the brain. If the athlete continues to jog or just walk, the tendency to faint will be minimized. Or, lie down with your feet and legs elevated to enhance blood flow back to the heart. Admittedly, these individuals do need fluids to boost their venous return and blood pressure. But, the trick is to ingest fluid in amounts that won't cause hyponatremia. • On a single summer day in 1995, nine US Marine recruits developed hyponatremia. Each soldier consumed 10-22 quarts of water over a few hours (Gardner JW. 2002). • One female competitor developed hyponatremia during a marathon after consuming 10 liters of fluid the night before the race (Eichner ER. 2002). WHO IS AT RISK FOR HYPONATREMIA? Hyponatremia can occur any time you drink water faster than your kidneys can eliminate it. At rest, the kidneys can produce up to 1000 ml (1 liter) of urine per hour. Most adults can actually drink more than 1000 ml per hour if they make a conscious effort. At rest, the kidneys can get rid of excess water in several hours. However, urine production declines by 20-60% during exercise compared to resting values. So, excessive intake of free water combined with reduced elimination increases the risk of hyponatremia. The risk of hyponatremia increases any time heavy sweating has occurred and water losses are replaced but sodium losses are not. Today, the concern regarding hyponatremia during distance races is so high that some marathons have reduced the number of water stations along the race course. For example, several years ago, the Houston Marathon reduced the number of water stations from 30 down to 15 and noticed fewer problems attributable to hyponatremia. So, how much water or sports drink should an athlete consume during a distance event? In the Fall of 2001, the International Marathon Medical Directors Association (IMMDA) met to develop an advisory statement regarding fluid replacement during marathon running. In this statement, released in 2002, they recommend marathoners drink NO MORE THAN 400-800 ml of fluid per hour. This may not seem like enough, but the document also mentions that some elite-level marathon racers only consume about 200-800 ml per hour during a race and have no problems with dehydration. The most recent "Exercise and Fluid Replacement" Position Stand from the American College of Sports Medicine, published Feb. 2007, also recommends this amount as an acceptable starting point for marathon runners (Sawka MN, et al. 2007). Tests conducted by the Gatorade Sports Science Institute showed that the average runner, in conditions of 85 degrees and 40 percent humidity, will lose about 2-4 lbs of body weight per hour through sweat loss (Runner's World, August 2004). a) Do a warm-up run to the point where you begin to perspire. c) Determine your weight (in pounds), naked, after drying off any remaining sweat. e) If you drink during the run, keep track of the amount (in ounces). Do not urinate during the run. f) Remove your shoes and clothes, and weigh yourself again, using the same procedure as in (c). g) Subtract your post-run weight from your pre-run weight. Multiply that value by 16.
h) If you drank during the run, add the number of ounces to the number obtained in line (g) above. Now you know the number of ounces you need to consume per hour. Divide this amount into thirds and try to consume that amount of fluid every 20 minutes during exercise. This formula was summarized in the August 2004 issue of Runner's World magazine, and can also be obtained from the USA Track & Field web site at www.USATF.org. Nancy Clark, MS, RD, offers this simple rule-of-thumb in chapter 8 of Sports Nutrition Guidebook, 5th edition: Weigh yourself, naked, before and after a 1-hr work-out. For each pound lost, you should consume 16-oz. of fluid. This amount should be divided by 4 and that amount should be consumed every 15 minutes during subsequent work-outs. SODIUM IS GOOD FOR YOU! In normal conversation, "salt" means sodium chloride. But, from a medical perspective, the term "salts" refers to many electrolytes such as sodium, potassium, calcium, magnesium, and chloride, all of which are lost during the sweating process (Sawka MN, et al. 2007). The loss of sodium and chloride in sweat is adaptive and variable. The body's ability to retain minerals like sodium and chloride improves as you get fitter. For example, untrained males and females lose roughly twice as much as trained athletes. Also, some athletes lose more sodium in their perspiration than other athletes, thus, generating the label "salty sweater." But, to be accurate, most cases of exercise-induced hyponatremia are due to excessive consumption of free water more than from heavy sweating. Nevertheless, healthy adults should take in some sodium if they are perspiring heavily. Salty foods, such as chips or pretzels, or, sports drinks are good choices. Even though sports drinks contain a relatively small amount of sodium (typically, only about 50-200 mg sodium per 8-oz. serving), they are still preferred over plain water because drinking plain water tends to shut down the sensation of thirst prematurely. Athletes will consume more fluids if the drink is flavored, and, if it contains some sodium. As you can see, most sports drinks don't provide much sodium. By comparison, PediaLyte (an electrolyte beverage generally given to children) contains 248 mg sodium and the energy drink Red Bull contains 207 mg sodium per 8-oz serving. Eight ounces of 1% milk contains 120 mg sodium. I recently switched from Gatorade Thirst Quencher (orange) as my favorite rehydration sports drink to Skratch Labs' Exercise Hydration Mix (pineapple). I think Skratch tastes a lot better, and, it has more sodium. It's been estimated that you can lose 1600 mg of sodium during a 2-hr endurance event, and, it's possible to lose as much as 5000 mg (5 g) in a single high-intensity workout. If you replace your fluid losses but not your sodium losses, you run the risk of developing hyponatremia. How to deal with huge sweat losses can be a complicated medical scenario. Even though, yes, you do lose electrolytes from sweating, when hyponatremia does develop, more often it is because the individual has consumed too much free water, not because they have lost massive amounts of sodium via sweat (Flinn SD, et al. 2000). However, increasing your sodium intake is generally a good idea. It will stimulate your thirst response (which is a good thing! ), while drinking plain water will suppress it. The reason is because the body's sensors keep careful track of the amount of sodium in your bloodstream. If sodium increases (in the bloodstream), your thirst response is stimulated. So, if you're perspiring a lot, increasing your salt intake is what you should be doing! When should these products be used? One scenario would be if you know you are a "salty sweater." These people lose higher amounts of electrolytes in their sweat. They can actually develop a white residue along the edge of a sweaty area on their clothing. This is not a precise diagnosis, but, if you have trouble with lightheadedness when you sweat even though you drink plenty of fluid, you might want to consider increasing your consumption of sodium. NOTE: Potassium supplements, however, should NEVER be used except under the supervision of a physician. There is a reason why potassium supplements are only available via a prescription and that's because too much potassium in the body can cause fatal cardiac arrhythmias. The amount of potassium lost via sweat does not differ between trained vs. untrained subjects (Wilmore JH, et al. 1999). I moved to Phoenix in 2009. Prior to that, I lived in Florida. So, I'm used to hot weather. In fact, I prefer it. However, there is a dramatic difference between the climate here compared to Florida. In Florida, the humidity is routinely well above 50%. But, in Phoenix, the humidity has gotten as low as 2% (two percent!) numerous times. When the humidity is that low, your perspiration evaporates immediately. In Arizona, my skin and clothes never get dripping wet like they did when I was living in Florida. It's deceiving how quickly you can get dehydrated here. As a health care and sports medicine professional, I know this. I do try to drink lots of water, but, sometimes I don't drink enough. As I explained at the beginning of this article, you can't rely only on your thirst reflex...you have to make a conscious effort to drink regularly. And I'm talking about routine daily intake, not just during exercise. But, after going over the research summarized in this review a 2nd time, and, reading up on some new sports drinks, I've come to the conclusion that I don't consume enough sodium. For many years, I have diligently avoided adding salt to my food. The medical profession has been recommending this for decades, right? My blood pressure runs about 100/70. This is great from a health perspective. But, when you combine just a tiny amount of dehydration with an already low BP, it's not surprising that lightheadedness occurs. • I am going to start adding salt to my food. I'm not worried about developing hypertension. Perspiring will compensate for the sodium intake (actually, it's the other way around: increasing my salt intake will compensate for my sodium losses), and, performing aerobic exercise keeps arteries healthy which is key to minimizing the risk of hypertension. • When I hike, I'm going to use Skratch Labs' "Exercise Hydration Mix" as my main rehydration drink (ie., as opposed to plain water). This sports drink has 360 mg sodium per scoop. Increasing sodium intake helps the kidney retain fluid inside the vascular compartment. In turn, this should help maintain blood pressure. If not, then I will use the high-sodium products: "Hyper Hydration Mix" by Skratch Labs, or, "The Right Stuff". • The concept of "drink as much as you can" during an endurance race is no longer recommended. • Thirst is a delayed signal. Consume adequate amounts of fluids (and sodium!) before you get thirsty. • Use the recommendation "400-800 ml per hour" only as a rough guide to how much you should drink during an endurance event. It's more accurate to determine your own specific losses. • Replacing roughly 16-oz for each pound lost per hour is also a useful guide. • If sweating is heavy, it's important to consume sodium, too. Q: Should athletes avoid caffeine and alcohol? ANSWER: If you don't drink caffeine-containing beverages regularly, then it's best to avoid them before, during, or after a lengthy race or event. While caffeine is a known diuretic, its diuretic effects are relatively mild. The diuretic effects of caffeine diminish with daily consumption. Currently, experts feel that the diuretic effects are not significant in someone who consumes caffeine regularly. Also, the kidney can easily reverse the diuretic action of caffeine once exercise begins (Graham TE, et al. 1998; Wemple RD, et al. 1997). While caffeine has been shown to enhance athletic performance, it can also promote thermogenesis...ie., it can aggravate the increase in core body temperature. So, this is something else to keep in mind. Alcohol is clearly detrimental. Alcohol is a stronger diuretic than caffeine. In addition to the fact that alcohol is a banned substance, it has negative effects on performance and thus should be avoided prior to, and during, competition. Q: Can glycerol help me stay hydrated? ANSWER: First of all, glycerol is a banned substance! Glycerol (also known as glycerin, and, not to be confused with glycogen) helps to "load" the circulatory system with an abnormally high amount of free water, and, also, reduces the rate at which the kidneys eliminate this excess. Because this is an artificial manipulation of normal physiology, somewhat analogous to increasing hematocrit with the use of erythropoeitin, glycerol is classified as a "plasma expander" and is banned both during and outside of competition. Glycerol has been investigated as an agent for promoting a state of "hyper-hydration." The theory is that this would help the athlete stay hydrated longer and, in turn, would enhance performance. Studies of glycerol have been conducted in athletes for over 15 years. Most of these studies do show that it lives up to its promise: Performance was enhanced during cycling (Anderson MJ, et al. 2001; Montner P, et al. 1996) and in triathletes (Coutts A, et al. 2002). The dose was generally 1.0 - 1.2 g/kg body weight and it was consumed roughly 2 hours prior to exercise testing. The most current Position Stand on fluid replacement from the American College of Sports Medicine was published in the Feb. 2007 issue of Medicine and Science in Sports and Exercise. • USA Track & Field (www.USATF.org) issued new hydration guidelines for athletes in April 2003. Their web site contains several papers on the topic of fluid replacement during exercise. 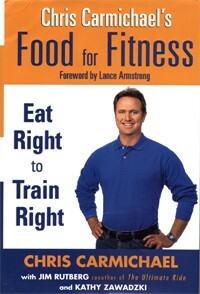 • Chapter 10 in Chris Carmichael's book Food For Fitness - Eat Right to Train Right has a good discussion of fluid requirements in athletes. It also summarizes sports drinks and energy drinks. For those who don't know, Carmichael was a former Olympic cyclist. This book was published in 2004. 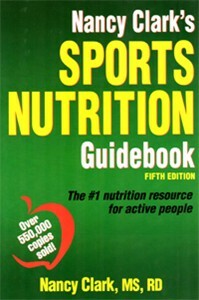 • In 2014, Nancy Clark, MS, RD, published the 5th edition of her popular book Sport Nutrition Guidebook. There is a reason why this book has sold over 550,000 copies: because it is well done. She covers fluid balance and hydration issues in Chapter 8. • Tim Noakes, MD, DSc, is considered one of the world's experts on hydration during exercise. 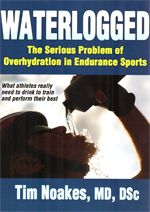 In 2012, he published the book Waterlogged - The Serious Problem of Overhydration in Endurance Sports. We found this book to be extremely difficult reading and therefore, can only recommend it for academics and graduate students in exercise science. See Books Reviews for detailed reviews of books like these. • Sports medicine professionals may wish to look at the web site for the International Marathon Medical Directors Association (IMMDA), an affiliate of the Association of International Marathons and Road Races (AIMS) (www.aimsworldrunning.org). IMMDA published an official position statement on fluid requirements in the July 2006 issue of the Clinical Journal of Sports Medicine. Wilmore JH, Costill DL. Physiology of Sport and Exercise 2nd ed., p. 323, Human Kinetics Publishers, Champaign, IL, 1999.